Saga Dawa is the triple blessed festival. This festival is considered as one of the holiest Buddhist festival for the Mahayana Buddhists. On this day the people visit monasteries and worship and offer butter lamps. Three important events connected to the life of Buddha are celebrated in this festival. These events are the Birth of Lord Buddha, Enlightenment taken by Lord Buddha and death of Lord Buddha or attaining Nirvana. This festival is celebrated on the full moon day of the 4th month of Buddhist lunar calendar around the end of May and early June. 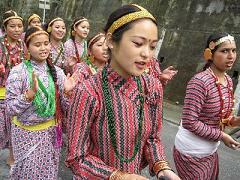 This festival is celebrated in Gangtok. On this day the monks carry the Holy Books of the Lord Buddha from the Tsuk-La-Khang monastery around the town in a large procession. Drukpa Teshi festival is celebrated by the Buddhists. This festival is celebrated as on this day the Buddha preached his first sermon of four Noble Truths to his five disciples at a deer park in Sarnath. The first Noble Truth is the Noble Truth of suffering. The Second Noble Truth is the truth of the origin of suffering Karma and Delusion and their causes. The third Noble Truth is the cessation of the suffering or the attainment of Nirvana. The fourth Noble Truth is the truth of the Eight Fold Path leading to Nirvana. This day is celebrated on the fourth day (Teshi) of the sixth month (Drukpa) of the Tibetan calendar in the month of July or August every year. This festival is celebrated in Gangtok where the prayers are held at the Deer Park and at Muguthang in extreme North Sikkim and a Yak race is also held during the festival. The word Phang means witness. Phang Lhabsol is a unique festival of Sikkim which was popularized by the third king of Sikkim, Chakdor Namgyal. In this festival the Mount Kanchendzonga is worshipped for its unifying powers. In this festival the treaty of blood brotherhood was also signed between the Lepchas and Bhutias by Khye Bumsa and Tetong Tek and the local deities were also invited to witness the occasion. On this day, the guardian deity is portrayed by masked Lama dances as a fiery red-faced deity with a crown of five skulls, riding a snow lion. To lighten the mood of the spectators, jesters called 'Atchars' play antics during the Chaams. The monks also performs the Pang-Toed dance on this day. This festival is celebrated on the 15th day of the 7th month around the end of August. 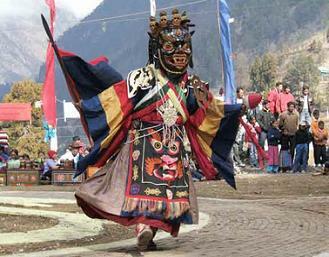 The Bumchu festival is celebrated at the Tashiding monastery in the month of January. The word 'Bum' means pot or vase and 'Chu' means water. During this festival, the pot that contains the Holy water is opened by the Lamas of the monastery. A part of the holy water is distributed amongst the devotees and the pot is replenished with water and sealed at the end of the festival which is opened only in the next Bumchu. The level of water in the pot foretells the future for the forthcoming year. If the water is up to the brim, it predicts that there would be bloodshed and disturbances. If the pot is almost dry it signifies famine and if it is half full, it predicts the year in which peace and prosperity will be there. Tantrayana is one of the path by which one can attain Nirvana or Enlightenment. Tantrayana emphasizes on the Tantric or mystic aspect of Buddhism and involves complex and esoteric rituals. The Supreme Tantra is one of the class of Tantrayana which combines male tantras and female tantras out of which Kalchakra is one of the deities. The rituals and meditations which are performed to Kalchakra with the main aim of attaining Nirvana is known as the Kalchakra Puja. Presently, the Dalai Lama, holds the Kalchakra Mass Initiation Puja usually once in three years which attracts the devotees from all over the world. Kalchakra deity is usually represented in union with his female consort Vishwamata. The Kalchakra Puja centers around the ‘Mandala’ which consists of the rituals, offerings and the deities concerned with the Puja. For the initiation ceremony, the Dalai Lama first prepares the disciple who have to take the tantric vows. The disciple is then initiated in a complex procedure which includes rituals that involves water, crown and the ubiquitous Vajra (Thunderbolt). Now the disciple can practice the tantras diligently with the ultimate aim to attain Nirvana. The Losoong festival is celebrated on the occasion of the end of the harvest season and the end of the tenth month of the Tibetan Year in the rural Sikkim. On this festival, the Chaam dances are performed at the Tsu-La-Khang monastery, Phodong monastery and Rumtek monastery and archery competitions are also held. This dance symbolize the exorcizing of the evil spirits of the year and the welcoming of the good spirit of the new year. During the dance the men become gods and don attires with mystical symbols. The Kagyed Dance is performed on the 28th and 29th day of the 10th month of the Tibetan Calendar, in the month of December. 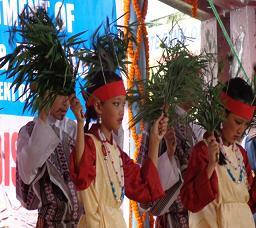 This dance symbolizes the destruction of the evil forces and prevailing of the peace and prosperity in Sikkim. The Chaam dancers are extremely popular. 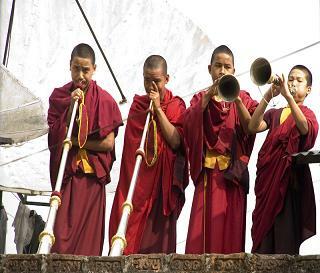 Chaams are the monks who are accompanied with the liturgical music and chanting. Some sort of the comic relief is also provided by the jesters with the dance. In this dance, various themes from the Buddhist mythology are enacted and it culminates with the burning of effigies made of flour, wood and paper.